Sitting amongst the crowd was new owner Dale Brown. Though he may be a new entrepreneur, Brown is not new to Ye Ole Pipe Shoppe & Cigar Lounge. When he moved to Jackson nearly thirty years ago, he also became a customer to the store. It was clear to me that Brown’s relationship with the shop and its community was one grown over time as he effortlessly moved amongst his old friends, one of those being Bob Mabry, the business’s former owner for the past twelve years. Mabry chuckled as he teased Brown about how they had switched roles from customer to owner and owner to customer. Dale chose to leave NovaTech as copier technician to become new owner of store in December 2017. Brown has enjoyed watching the business grow and meeting new customers. Ye Ole Pipe Shoppe & Cigar Lounge sells major brands of cigars, such as Arturo Fuente, Rocky Patel, H. Upmann, and Drew Estate, to name a few. 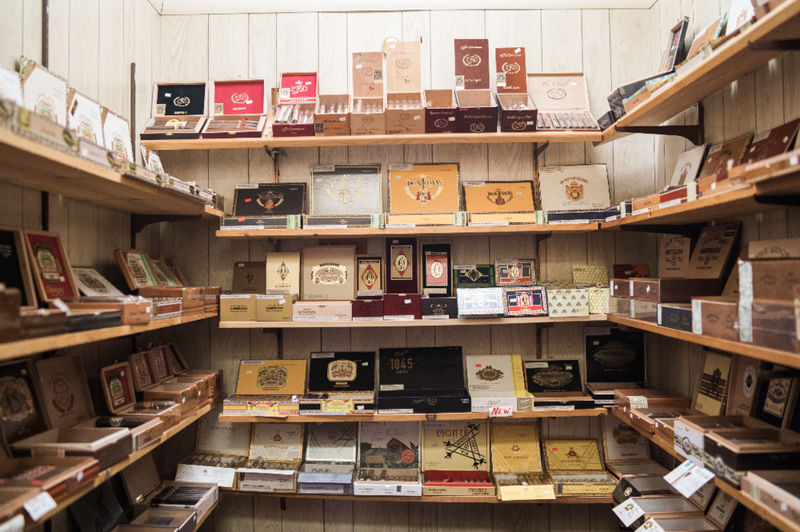 Besides the wall-to-wall shelves packed full of cigars, Brown also has a humidor, a humidity-controlled room used to store and protect various forms of tobacco to keep them at an ideal moisture level, ensuring that the products sold at the shop are in their best condition. When most people hear the word “cigar,” they instantly imagine only men smoking them. But Brown said you would be surprised about the number of female cigar lovers in Jackson. From what he has observed, most men like a richer and fuller taste, and women tend towards the sweeter flavors. I agree with Brown on the flavors of the cigars. One of my personal favorites is Java Mint by Drew Estate, whose taste and smell is like mint chocolate chip ice cream with a hint of mocha. Another is Tatianna’s Groovy Blue, which carries hints of berries and vanilla. The shop hosts happy hours and specials events for their wide-ranging clientele, welcoming everyone from those who have never smoked a cigar to long-time connoisseurs. Look for a shape that you like and make sure it feels comfortable smoking. Check the wrapper; it should not have any gaps or tears. Avoid any cigar with spots. Avoid any cigar that feel dry or that flake; it may not have been kept in proper humidity. Choose a cigar with a sheen; this indicates whether it was well cared for. Make sure the cigar is well filled with tobacco; it should feel firm with no weak spots or dents. Know that if you enjoy the smell of the cigar, you will more than likely enjoy the taste as well. 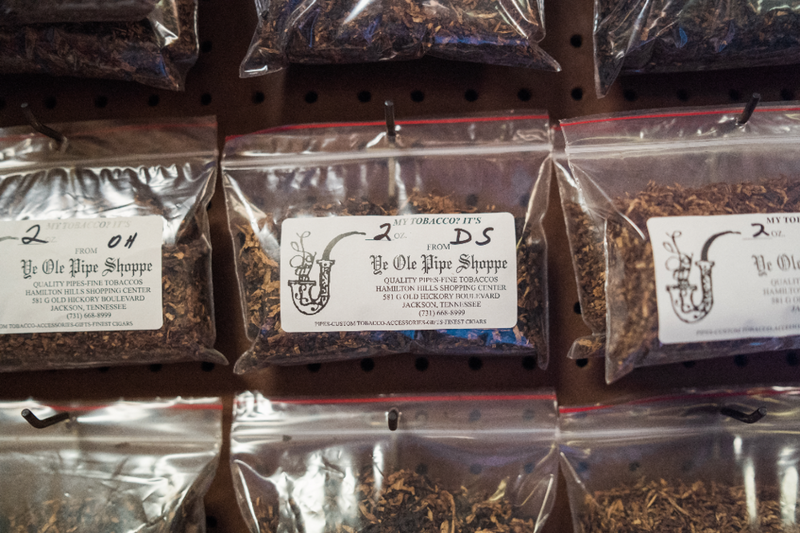 Ye Ole Pipe Shoppe & Cigar Lounge is located in Suite G of 581 Old Hickory Boulevard and is open Monday through Saturday. To learn more, visit their Facebook page or call them at 731.668.8999. Asanta Brooks is an author and freelance writer. Her passion for writing stemmed from creating and illustrating comic strips as a child, which lead to her becoming involved with the high school paper and excelling as a feature writer for her college paper. She resides in Jackson with her adorably energetic four-year-old son, Alex.